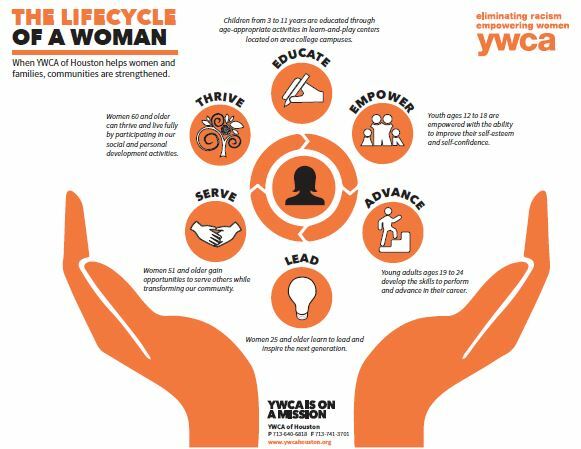 SINCE 1907, THE YWCA HOUSTON HAS BEEN ON A MISSION TO ELIMINATE BARRIERS AND EMPOWER WOMEN AND GIRLS AT EVERY STAGE OF THEIR LIFE. From 12-year olds to 90 plus, YWCA Houston offers programs and services that help women and girls succeed. We’re on a mission to help them conquer life’s challenges such as breaking down barriers to college and career while empowering them with the self-confidence to lead, advance, and be good citizens. We provide homeless women with housing during the time of acute distress. We are the go-to organization to help women enhance their social and personal development and live life fully. We call this continuum of program and services the Lifecycle of a Woman! When we help women and girls with life’s challenges, we strengthen families and our communities.